By Dominik Czernia - PhD candidate. This hydrostatic pressure calculator determines the pressure that arises at a certain depth of a liquid. Have you ever wondered what is the pressure level in water compared to the atmospheric pressure? What determines the pressure? Read on if you want to find out how you can estimate fluid pressure using the hydrostatic pressure equation. You can also check our air pressure at altitude calculator if you don't want to go deeper, but higher. Each particle of a liquid is subjected to a gravitational force directed towards the Earth. The deeper we are, the more such particles are above us, and the higher is the fluid pressure (because the acting force is greater - see our pressure calculator). If the fluid is at rest, we call it hydrostatic pressure. An interesting fact is that the value of hydrostatic pressure does not depend on the size and shape of the tank, but only on the depth. Surprisingly, the same hydrostatic pressure will be present in the huge pool and thin pipe, provided they have the same height. p0 is the external pressure (usually atmospheric pressure p0 = 1 atm = 1013.25 hPa). The above formula for hydrostatic pressure allows determining buoyancy force, which was discovered for the first time by an ancient inventor - Archimedes. In the advanced mode of our hydrostatic pressure calculator, you can change both the gravitational acceleration g and the external pressure p0. The deepest part of the world's oceans is the Mariana Trench which is located in the Pacific Ocean. It reaches the highest known depth of 10.994 m. Let's use our hydrostatic pressure calculator to estimate the pressure at the bottom of the Marian Trench (remember to choose salty water with ρ = 1022 kg/m³). Astonishingly, the pressure here is more than 1000 times bigger than the atmospheric pressure! Dominik Czernia - PhD candidate. 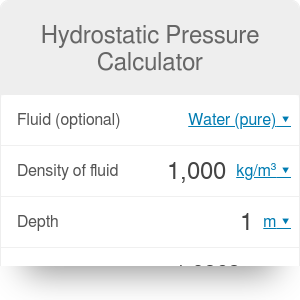 Hydrostatic Pressure Calculator can be embedded on your website to enrich the content you wrote and make it easier for your visitors to understand your message.